Today I’m going to ask for collaborators. I have an unfinished story that needs an ending. I could cobble one together, but it wouldn&apos;t be as strong as the one you can help me create. Together we can author an act of human kindness, just in time for the holidays. The best part? All you&apos;ll need to do is write a few words and click. Curious? Then let me tell you the story of the lost diaries of Florence Baumrucker. Our tale begins in the Clearance section of a Half Price Books store. HPB is a regional chain. You may have one near you; they have storefronts in 18 states. I have nine in easy haunting distance in Houston. Their business model is typical: they buy your unwanted books, music, and media for a little cash, resell things for which there’s demand, and donate or recycle the rest. Most Half Price Books have Clearance shelves. Most clearance is vanilla: unmoved stock, titles they have in triplicate, books that are too old or a little beat up, unlikely to sell for more than a couple of bucks. Occasionally there&apos;s treasure. For example, my well-loved copy of the 1920 doorstop-sized THE EPICUREAN cookbook was a two-dollar find. 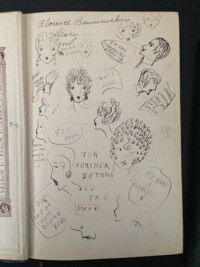 Inside the front cover of the 1927 calendar were fifteen doodles of faces, some with word bubbles, plus the declarations “Florence Baumrucker Diary” and “FOR FURTHER DETAILS SEE THE MOON.” The 1928 edition had Florence&apos;s name in the front, beneath which someone added “IS A GOOD LITTLE BAD GIRL”. I skimmed both volumes. There were indeed diary entries, some extensive, plus more doodles, scraps of fabric, occasional bits of ephemera tucked between pages. Did I pay a dollar a piece for them? I brought them home, set them aside, and they were promptly swallowed by the day-to-day shuffle. It was a few months before I came across them again in a stack, so before they could fade once more into the mist like Brigadoon, I opened the cover of one and began thumbing pages. If Florence was a “good little bad girl,” this is not that chronicle. She was around 13 in 1927 (in a February, 1928 entry she notes her first day of high school). She spent a lot of time with friends; went to the movies or into Chicago for plays; was a meticulous chronicler of parties; swam and skated and played tennis; kept a list of events and the boys with whom she&apos;d gone; was counsel of the latin club; took music lessons; played bridge and bunco; liked to design and sew her own clothes, which she sometimes sketched. In the back of one book are two hand-recorded line scores for ballgames between the Cubs and the Reds. She was an all-American, pre-Great Depression girl, a Frank Capra heroine before Capra made talkies. But as writing fodder, the diaries were a bust. Florence chronicled little in the way of drama or conflict. Still, there was a simple joy in the short snapshots of her life (“This afternoon, Jimmy, Doris, and I went to the show. It was Colleen Moore in “Naughty, But Nice”, It was adorable. Funny as the dickens.”) that led me as I read to wonder what had become of Florence Baumrucker. While Florence provided copious names and dates, they were more haystack than needle. My sister does genealogical research and would tell you that even in the Internet age, you either have a couple of key pieces of information that tie everything together, or you throw things against the wall to see what sticks while you search for those pieces. Florence kept just such a key piece of info preserved between the pages for March 30 and 31, 1928: a grade report from Oak Park and River Forest Township High School in the West Chicago suburbs. If the school&apos;s name sounds familiar, the Class of 1917 included Ernest Hemingway. The school persists today, still teaching classes in the same building where Florence earned A&apos;s and AA&apos;s across the board. As a bonus, the grade report was mailed to her father at his place of work, giving me his name and his employer&apos;s.
Armed with these small pieces of data - her name and approximate age, a school, a year, her father&apos;s name and place of work - I grabbed my trusty Finding shovel and waded into the web. Ninety minutes, three census records, and four Google searches later, I had the abbreviated history of Florence Baumrucker, including a photo from the 1930s. It became evident she wanted to be found, heard, and even seen, despite the fact she was dead. Florence Baumrucker was born in Chicago and lived in River Forest, IL until she graduated from Oak Park and River Forest Township High School in 1931. As a senior, she was one of two writers of the “About the High School” news column for Oak Park’s Oak Parker newspaper. In the autumn of 1931, she headed east to Cambridge, MA to attend Radcliffe College. By chance that October, the Atlas News Agency featured her in a press photo taken on campus. She&apos;s a demure-looking brunette, caught in front of a campus building in a dark ensemble over a light blouse and a colorful scarf that isn’t done justice in black and white. Handkerchief in her right hand, notebook in her left, her brunette hair is pulled up on her head. She offers a slight smile, neither forced nor bored, but her right foot is blurred, as if it&apos;s anxious to go somewhere. Florence graduated from Radcliffe and moved to New York City, met a Columbia Law School graduate, and married him in 1939 to become Florence Fort. She and her husband pulled up stakes during World War II and moved to the Washington DC area. They lived on both sides of the Potomac over the course of the decades that followed. Florence&apos;s life echoed the one she chronicled in River Forest: she was an active member of numerous social clubs in the area and volunteered with community organizations, including the Red Cross during the Vietnam War. She and her husband were married for 64 years before he predeceased her. Florence Fort died in 2012, 98 years old, mother of three, with 14 grand- and great-grandchildren. The immediate mystery was how two almost ninety-year-old diaries of a woman who lived and died on the east coast wound their way to the HBP clearance rack in Houston, but Occam’s Razor cut true: further digging indicated Florence’s oldest son, now 76 and a retired CEO, at one time lived in the Houston area. Whether the books were mistaken as inconsequential and dropped in a trade box by accident or intentionally discarded, I couldn&apos;t say. No matter how they arrived, it was still unusual for a couple of well-used desk calendars to be shelved for resale. Perhaps I wasn&apos;t the only one who came under Florence&apos;s thrall where they were concerned. My explorations of my family history have taught me a couple of things. One is: questions arise long after there’s no one left to answer them. Often, your background doesn&apos;t become interesting until you get older and bold enough to ask about your ancestors. By then, a shrug and an anecdote may be all that&apos;s left. People take the lion&apos;s share of their personal history to the grave every day. The other is it’s exciting to discover a relic of your ancestors. As I scan old family negatives, every image I&apos;ve never seen before is a wonder, a new frame in the film of my life. 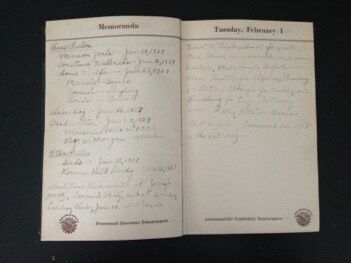 I think I’d be over the moon if longhand diaries kept by my grandmother resurfaced, offering a window into who she was at an age I never knew her, in a world that had moved on before I was born. I have no idea how or why Florence’s diaries wound up on that shelf that day, but I&apos;ve come to believe I was supposed to find them, snag my curiosity on them, and save them from being recycled. I believe they&apos;re meant to find their way home to her family. And among the descendants Florence Fort left behind when she died six years ago, I have to believe at least one of them might want such heirlooms back. I could be wrong. I don’t believe I am. I&apos;m asking you to share this story, boost its profile on social media, carry it far enough to reach at least one of Florence’s descendants who&apos;s interested in taking her diaries back. Facebook, Twitter, whatever old school or cutting edge digital society you frequent. And if it goes far enough, I invite Florence&apos;s family to message me on Facebook (Doug Lane Writes) or via email through my website (florence(at)douglasjlane.com), so I can arrange the diaries’ return. No cost, no strings. I&apos;ll even pay the shipping. Of course, this is the 21st Century, the Age of the Internet Catfisher, so in an effort to separate real relatives from weirdos who think it&apos;s fun to impersonate other people, I&apos;ll have a couple of questions to ask of any relative of Florence&apos;s who contacts me that need to be answered. I don&apos;t like having to do it, but that&apos;s the shape of the lake upon which we&apos;re rowing. If a couple months go by absent an interested relative, I’ll pull the plug and go with my original notion for the ending for the diaries, one I&apos;ll share if it comes to that point. I have "an" ending. I want "the" ending. And for anyone who helps write "the" ending: if this post successfully returns the diaries to Florence’s family, I’ll put the names everyone who shared the article (based on whatever &apos;Shared By&apos; stats I can dig out of Facebook, Twitter, etc) in a hat, and one person drawn at random will receive the final numbered copy (50 of 50) of the signed, limited hardcover of my new collection of short fiction, SHADY ACRES AND DARKER PLACES. That&apos;s the story so far of the lost diaries of Florence Baumrucker. Let&apos;s see if we can give it a brilliant conclusion.